Products - Naresh Systems, Inc. The iMatchCode ™ is a complete turnkey system for Barcode Verification. It has RFID, Wi-Fi connectivity, event log, counters and several interfacing outputs for easy systems integration. Security is achieved through a physical key switch and Wi-Fi remote control. The system can run at speeds up to 3,000 labels per minute! It provides an LCD user interface, DC power for the scanner, interfacing, logic and compares the barcode to a preset reference. It generates a one (1) second output for a REJECT condition and a 10mS pulse for good reads. The system is highly configurable to suit the customers' need. 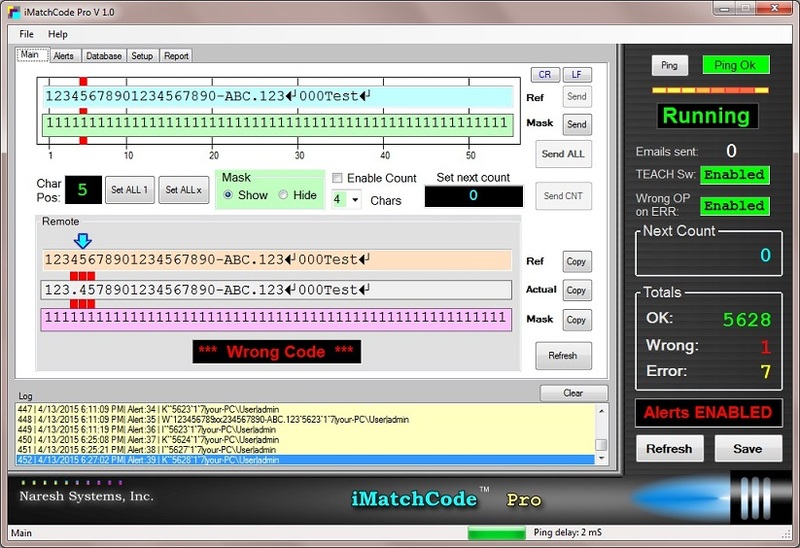 Dynamic MatchCode ™ is a feature that allow the customer to send a barcode string to be compared to the string read by the iMatchCode ™ unit. The system will dynamically compare the string with the currently scanned barcode. Typically this can be used for verifying a printout from a barcode printer. Automated Alerts for Wrong Code, Teach, Idle/Run, Error etc.